What do you get when Sonic, or someone who is clearly supposed to be a representation of him appears in something that's NOT a Sonic show or game? You get a 'Sonic Cameo'! These aren't items, they're representations of Sonic or Sonic characters appearing outside of anything where you'd expect to find him. 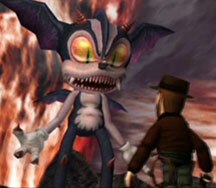 Since Sonic is so popular it's no wonder that a variety of different media reference him. In the movie Wayne's World near the beginning they see an ad for an arcade, and in the background, you can clearly see that Sonic 1 is being played. You can see the "Score Time and Rings" display in the upper corner, as well as a few rings and possibly some green ground. 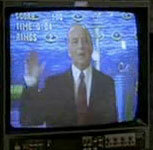 It's a very small reference, but it's interesting to catch it in this older 1990s era movie. Sonic the Hedgehog made a cameo on The Simpsons! You can see a sort of reflection of a Sonic-like guy to the right of the photo. Although he does look "Simpsons-Styled". 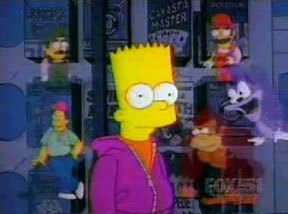 Mario and Luigi are funny looking here too...The characters are trying to get Bart to steal a video game. Episode #139 (Season 7) "Marge Be Not Proud". You can read more about the episode here: http://www.tv.com/the-simpsons/marge-be-not-proud/episode/1424/trivia.html Info courtesy of Steven Matarazzo. 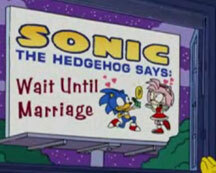 The Simpsons reference Sonic once again. After defeating The Liekand in Level 6, it transforms into a rat. This may be a reference to the Sonic the Hedgehog series for the Sega Genesis, in which defeated enemies almost always revealed their power sources, which were various animals. The "Jaro" looks very similar to the "Red Eye" mini-boss in the Death Egg level from Sonic & Knuckles. This is a screenshot of the Illbleed game. With this video you can see it rolls around and rings come out as it fights. It is also interesting to note Ryan Drummond did the voice for it. 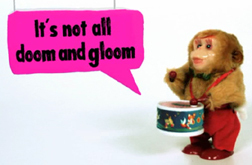 This is a screen shot from the selection screen of Wacky Worlds the game. This is a cameo from Christmas NiGHTS. 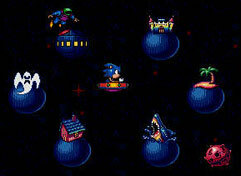 NiGHTS itself was a SonicTeam game for the Saturn that didn't get that much play (despite being very unique and interesting for its time) due to low levels of Saturn ownership. This is Christmas NiGHTS though, a special gift-disk that was only available if you bought a magazine at a certain time. It featured unlockable 'gifts' including art, music playbacks and the ability to run the level as Reala (an evil nightmaren, vaguely similar in structure to NiGHTS) and as NiGHTS itself in Christmas theme...skin. cannot fly (and the level is built for flying) If you can beat the level you get to fight a boss, which looks like a holiday theme Eggman...though it is a reskin of the regular NiGHTS boss "Puffy" (Puffy was a ball-shaped opera-singing rabbit like woman) In this case, she's re-skinned to look like Eggman and you have to throw him through the same walls to trap him at the end of a curving hall. It was a remarkable cameo at the time, made even more exclusive by the rarity of the actual Christmas NiGHTS disk. The disk is in the SonicGear personal collection. Video cameo discovered by AutobotWheelie. 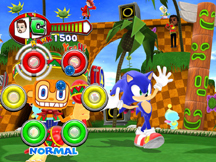 The musical rythmn game Samba De Amigo was also worked on by SonicTeam, so it's not much a wonder that Sonic would be able to make a cameo appearance there. With this screenshot you can see him dancing near Amigo, the cubic monkey & star of the game. They're in a Sonic 1 like Green Hill type of setting, complete with totem pole, sun flower, loop, and ring monitor. In the background you can spot some wii miis and even a Chao. It's cool to see they've worked Sonic in once again!